Looking for a convenient and compact shovel? 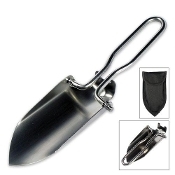 This folding shovel is just the tool you need! Constructed of stainless steel, this shovel can stand up to whatever job. Folds to a convenient size and fits neatly into the nylon carrying pouch (included). Great for camping, backpacking, gardening, outdoor activities, etc..